If you buy our favorite air fryer straight from the source, it’s going to cost you $160. And at that price, the Oster Dura Ceramic Air Fryer is worth every penny and then some. This excellent air fryer is the best we’ve ever tested, and it uses proprietary tilting along with multiple heat sources to cook evenly every time. 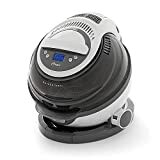 But it’s also much more than just an air fryer, with multiple cooking modes like an Instant Pot that include baking, grilling, and plenty more. Like we said, it’s worth every penny and more at full retail. If you buy one right now on Amazon though, you’ll save about $55.